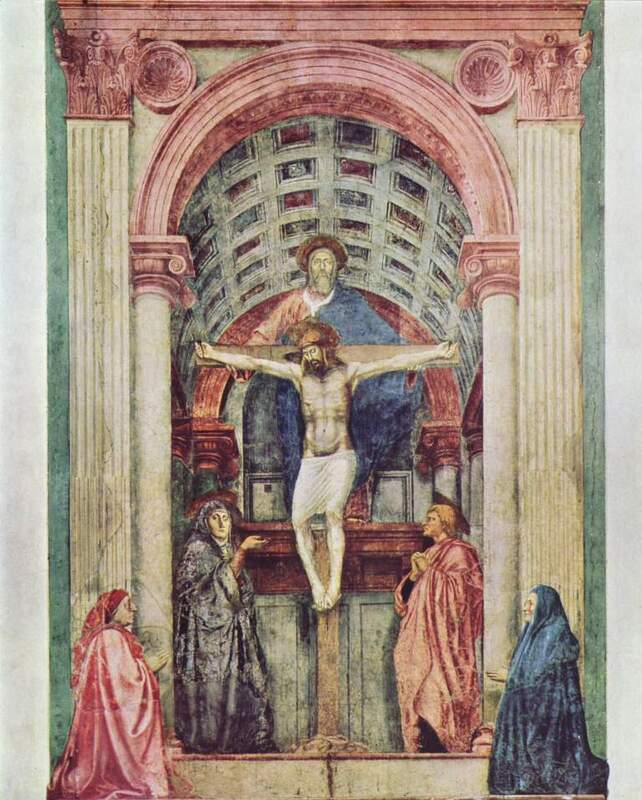 Despite clicking on and enlarging the second image by Masaccio, I cannot see the dove at all. (“The spirit in the form of the dove darts between the two.”). Is my perception off? Is it hard to see? Can I get a hint? As to the nature of the Trinity, I wonder why the holy spirit is always a dove. Why did this particular emblem become representative of the holy spirit? I prefer to “see” this differently though my perception is based on a dearth of knowledge of medieval and renaissance art. I think of it two ways — three interlocking rings in a triangle like 3/5 of the Olympic symbol. I like the primary colors of red, blue, and yellow, so each complete in mathematical perfection as a circle and between them creating all colors. I like the symmetry of this and the variety, I guess. In the same way in the artistic representations, I think the three should overlap like in the bottom modern stained glass window the wings of the dove should enfold both male figures like another layer of God’s red robe or perhaps be overlaid as a bird with outstretched wings superimposed upon the held Jesus figure. (I like this versions composition as a kind of pieta because it suggests to me that we are similarly being held up.) In terms of pathos, I like the top figure best and can thoroughly understand why it might have become the default image, so to speak. 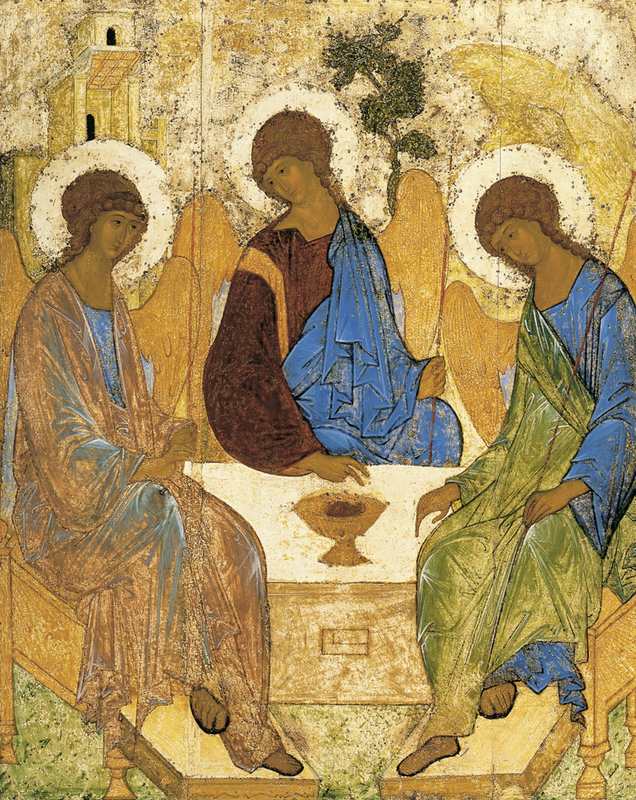 The three characters in it are equally represented, each divine with wings and haloes apparent with only the center figure slightly above the other two… and yet they also strike me as comfortable and relaxed sitting around a table with a dish of wine? Food? A simple repast like enjoying coffee today. It strikes me as just a little bit ironic that the figures seem far more comfortable sitting around a table together than we are with the idea of the trinity as if we should just sit down over a cup of coffee or tea and discuss, debate, muse but in the end merely accept the idea in both its complexity and ultimate simplicity. Thank you for this post; it really helped me to “see” differently and examine how I think about this. It also makes me wonder what a truly modern representation of the Trinity might look like. The Spirit is represented by the dove which looks like a wishbone between the top of Jesus’s head and the Father’s chin. It is certainly diminutive in scale compared to the other two and we might even draw some theological conclusions about that!